Got a Captain’s Boarding Pass? 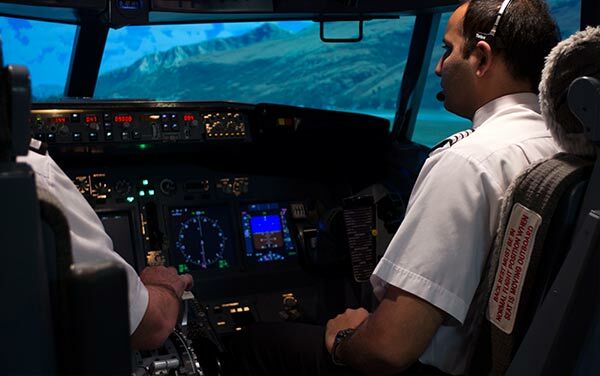 Our simulator delivers a superior learning environment by providing pilots the opportunity to train in a fully enclosed cockpit, supported by accurate visual graphics – thus reducing transition times and significantly lowering training costs. Our simulator is modelled on a modern twin jet aircraft, replicating the cockpit of a Boeing 737NG, with functional flight deck systems and authentic representation of airports, weather and terrain. Our product guarantees quality outcomes for pilots and training organisations. We have designed our pilot courses to introduce jet flying and the glass cockpit environment into training modules at an early stage; thus delivering intensive lessons which cannot be achieved on basic flat panel training devices. This exposure to a genuine cockpit with a precise Flight Management System allows pilots to master complex programmes in a cost-effective manner. Preparation in our simulator ensures that pilots learn effective multi-crew coordination and communication skills. Effective training on all flight manoeuvres with accurate and responsive indicators guarantees that pilots are exposed to a myriad of challenges, and enables them to focus on specific training needs. Pilots using the FLY A JET simulator are potentially better prepared for entering Full Flight Simulator (FFS) than those making the transition directly from flat panel training systems. This will significantly reduce the time each pilot is required to spend in costly FFS training units. The FLY A JET simulator device can deliver significant improvements in the quality of learning, which will ultimately result in more capable pilots. To be able to achieve outcome in a cost-effective and timely manner ensures that considering FLY A JET FTD for inclusion in any training regime is a wise decision. The simulator is based on the Boeing 737NG. It is designed specifically as an entry level 3 training device with capability for deployment as a retail experience simulator. It provides a superb environment that replicates a modern twin jet environment. The visual system is capable of rendering: day, night, dawn and dusk visuals, selectable special effects, fog, haze, sun glare. Airport lighting detail includes taxiway markings, runway edge, runway centreline and taxiway lighting, runway heading indicators, touchdown zone, threshold markings, approach guidance lighting and approach lead-in lighting. The throttle console has the following features: Motorised Thrust Levers, Thrust Reverse Levers, Flap Lever with Go Around Gates, Motorised Speed Brake Lever, TO/GA Switch, A/T Disconnect Switches, Moving Stabiliser, Trim Wheels and Pointers, Fuel Control Switches and Park Brake. The FLY A JET simulator is known as the PS3 and is manufactured in Christchurch, New Zealand. It is designed as an authentic aviation device. Copyright © 2019 FLYAJET Flight Simulator. All Rights Reserved.